Hey guys!Â Thereâ€™s another race that I want to joinâ€¦ Calling all friends and runners, join me! 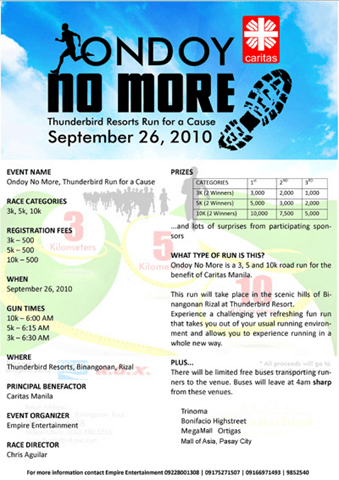 Ondoy No More is a 3k, 5k and 10k road run for the benefit of Caritas Manila.Â This run will take place in the scenic hills of Binangonan Rizal at Thunderbird Resort.Â Experience a challenging yet refreshing fun run that takes you out of your usual environment and allows you to experience running in a whole new way. There will also be limited free buses transporting runners to the venue.Â Buses will leave at 4am sharp from the following venues: Trinoma, Bonifacio Highstreet, MegaMall Ortigas and Mall of Asia, Pasay City. Eeeek! Why so early?! Need to start running na talaga!!!! LOL! oh game! you wanna come with? shocks! you guys goin? i wanna try! will ask arthur. i need to start running tuloy! if ever malamang 3k lang kami. kayo?